Apparently, Santa's been hitting the eggnog. The other day, he decided to make a quick stop in St. Michaels, MD, to pick up some last-minute toys. The elves at the North Pole were all calling in sick (also from too much eggnog) and Santa was desperate. He loaded a few things for early delivery, climbed aboard, and called for the reindeer. But the reindeer weren't cooperating, either. They'd all eaten way too much Christmas fudge and with bellies that full and a sugar high quickly becoming a sugar crash, they refused to fly high above the radar. "Oh heck to the no", Rudolph muttered. "Just make sure your hooves don't hit any trees and we're all good." Eggnog has a bad habit of making Santa not only sleepy but dizzy, and he'd left his GPS in his other sleigh. (Yes, there's another sleigh, the much larger semi-truck-sized sleigh for the 24th.) Unfortunately for him, he was coming in WAY too low into a field in St. Michaels when a jet plane had the same idea. The field was a perfect landing spot for a sleigh, but the jet had to make a bit of a crash landing when Rudolph's nose failed to glow so bright and all of a sudden Mr. Air Force Pilot was faced with an early Christmas -- or perhaps, the postponement of the REAL one. Panda-freaking-monium. 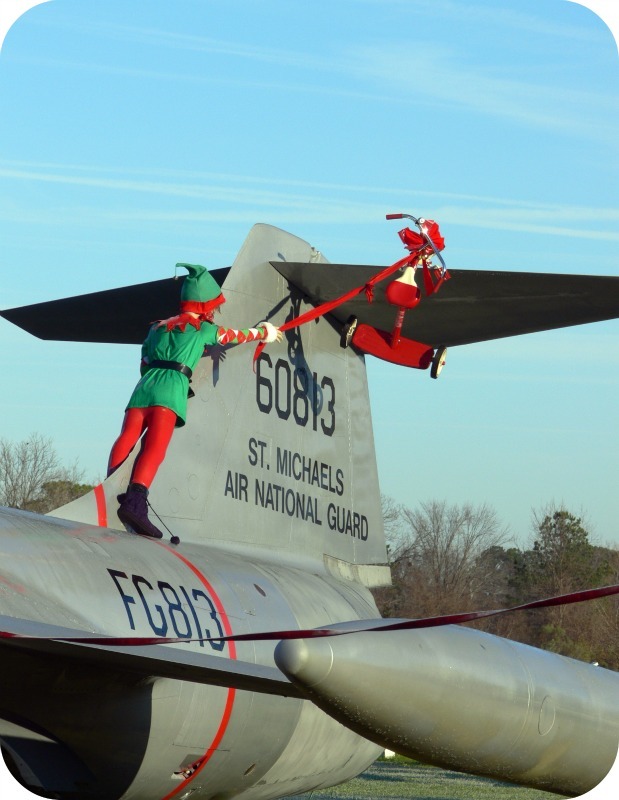 The pitot tube of the jet pierced the sleigh, hurting no one but tossing everything up in the air. While some of the toys made it back into the sleigh, quite a few didn't. Santa had to coax Rudolph out of the stalled engine, where he'd tried to hide himself for fear of Santa's jolly old self flipping out and starting to think of venison stew. Fortunately one of Santa's elves had called shotgun and was less rattled than the rest of the crew, and he started rescuing some of the toys. 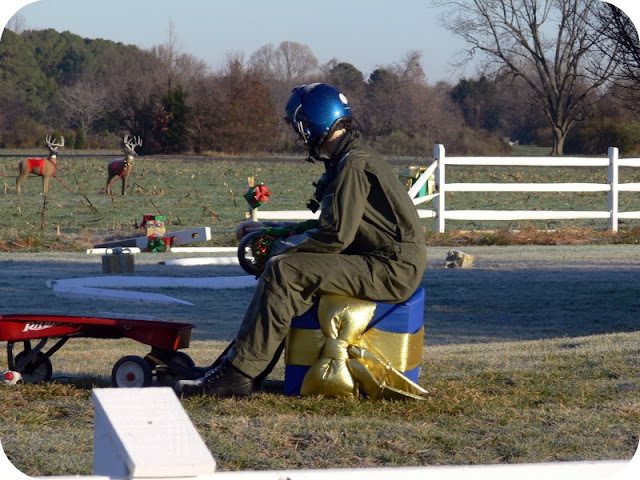 The pilot, unharmed but shaken, sat on a present and thought about how he was going to explain THIS one to the General. If the General didn't believe in Santa, he sure as heck would now! As you can see, packages weren't the only thing scattered all over the place. 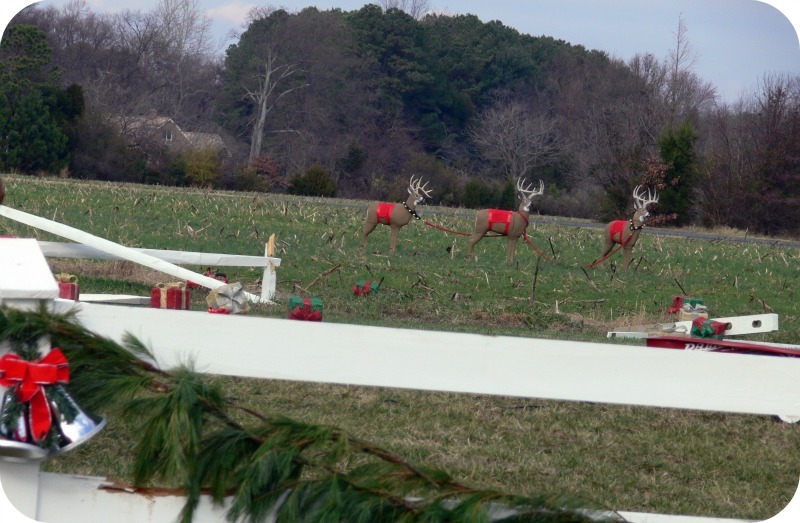 The rest of the reindeer were hanging out behind the shattered fence, which had broken during the crash landing. None of the other reindeer wanted to play any reindeer games, and they also didn't want to get whatever was coming to Rudolph. In the end, as all good Christmas stories do, everything turned out perfectly fine. Rudolph jumped out of the turbine when Santa promised to behave. The elf picked up and packed up all the scattered toys (although he fully planned on contacting his union rep AND filing for Workman's Comp). 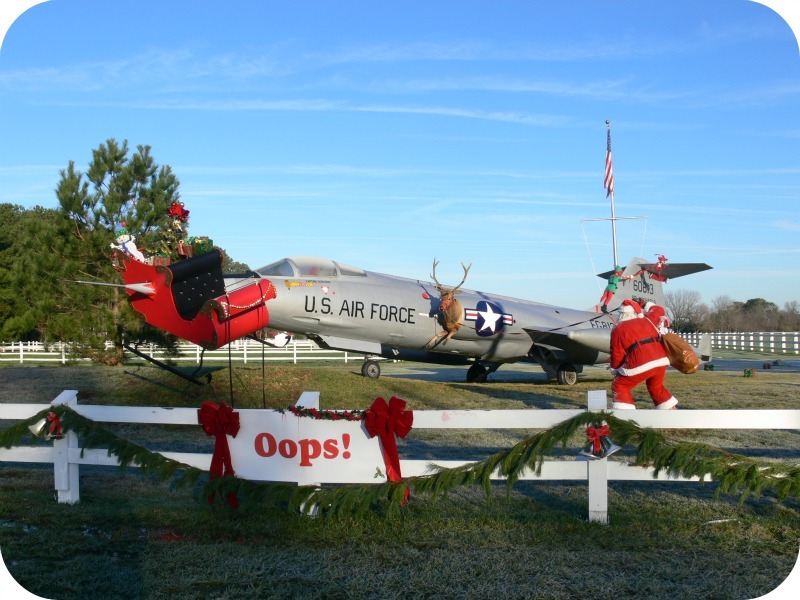 The pilot helped Santa pull the sleigh off the pitot tube and they discovered it was perfectly flyable, but everyone decided to head into town for a nice dinner before attempting any more flying. Remember this post, about Memorial Day? Well, this same gentleman created this tableau. I about wrecked my car laughing when I first passed it. 1) Always carry your GPS. 2) Don't drink eggnog and drive. 3) Don't let the reindeer eat an hour before flying. 4) Be careful who calls shotgun. How clever! I love that this person took so much time with this fun Christmas scene! Thanks for sharing, and for the smiles! ROTFLMAO OMG... MUST SHARE !!! LOL! Too cute. I'll be laughing the rest of the day. Happy Happy and a Merry Merry to you! Oh my goodness! I wish I could be there to see it in person, my boys would flip out. I'm almost afraid to show them the pictures for fear they'd think Santa wouldn't be coming this year after all. I'd have driven through the fence laughing at this - too cute! That's really cute. People who do such things are great fun! LOL - that's a good one! Oh my gosh that was great! He did a fantastic job and I love the story along with the pics! I so hope you are feeling better! Take care. I saw that picture and thought immediately of the pictures you posted on Memorial Day. Glad to see creativity at work and play. I do remember the Memorial Day post. This guy is genius and so are you with the tale you've told. Thank you! You send a wee bit of Christmas mirth my way. Gotta love living in Maryland. This is hilarious! Love your story too! So glad that you didn't crash your vehicle as well. 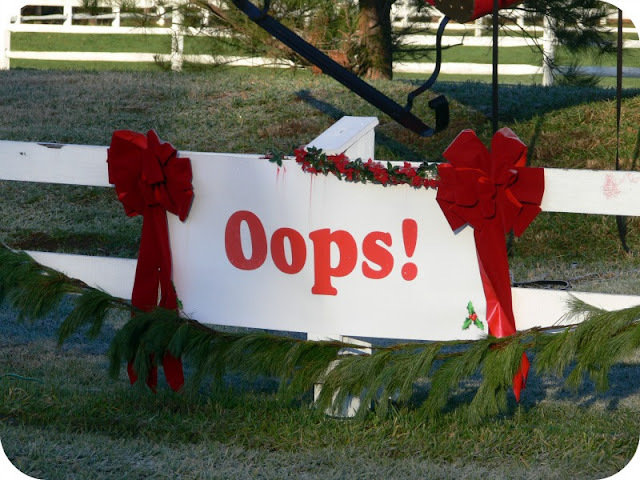 Could you imagine a car accident in front of a sleigh/airplane accident. "I'm sorry officer, but I was distracted by Santa and his reindeer"! Have a safe and merry Christmas! 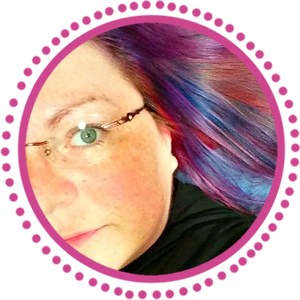 Great post, Lori! I love that kind of creativity! Lori you make me smile!! Feliz Navidad from Puerto Rico! Thanks for the laughs! Too funny! That was the best Santa Story! I loved the pictures. Happy Holidays to you and your and family! This is just hilarious, what an imagination. I was laughing so hubby had to come see, he just cracked up. That was amazing! Is it at St. Michael's? I have to drive over there when my girls get home for Christmas! Lori....so glad that you're feeling better and your post was hysterical! Love the way you told the story... and thanks for the smile to start my day. I've always said eggnog is bad for you. 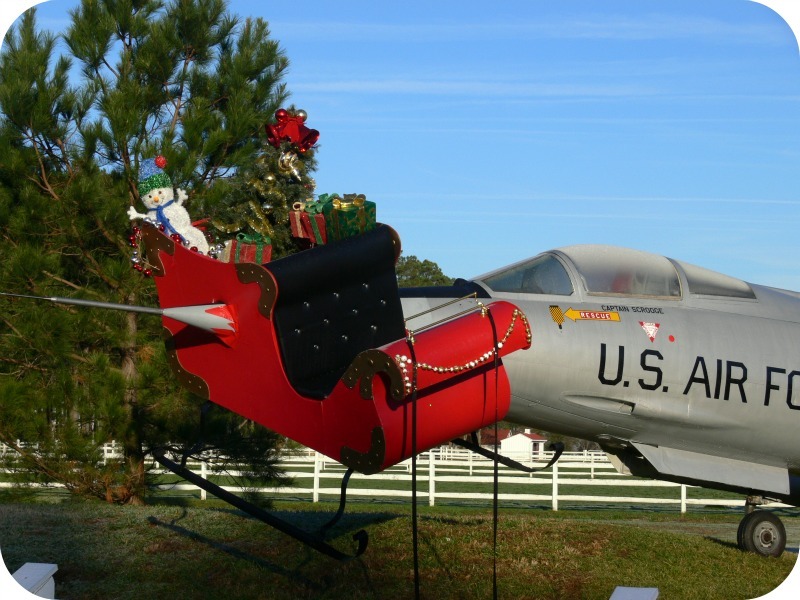 I wonder if Santa needs a special license to fly his sleigh. Laughter is the best medicine. Just back from a budget meeting and while that was humorous from time to time, this has me smiling all the way to slumberland. That is hilarious. Soooooo cool! Lori, It is amazing how the creative mind works. 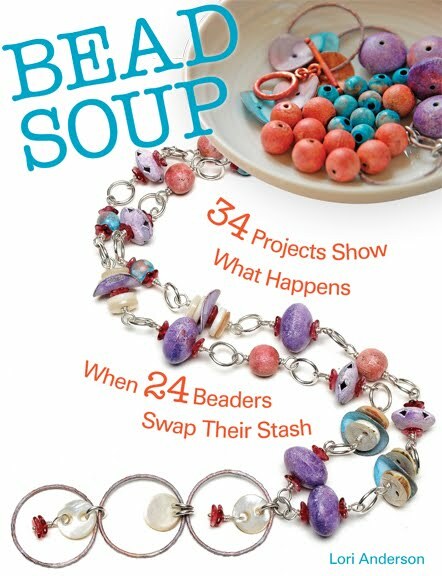 I enjoyed the story that went along with the pictures. Love this! I'll have to show it to my nephew to explain why his present might be late! This is so cute! Thanks for the smile. 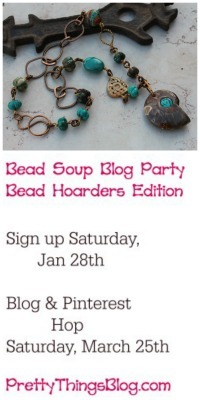 Thank you for participating in the blog hop and all that you do for the creative types during the rest of the year. What a great way to start my day with a good laugh. Thank you for the Christmas cheer! I am glad you are feeling better. Thanks for the Christas cheer! I am glad you are feeling better. What was in Santa's eggnog? There are some amazing things in your goody box. 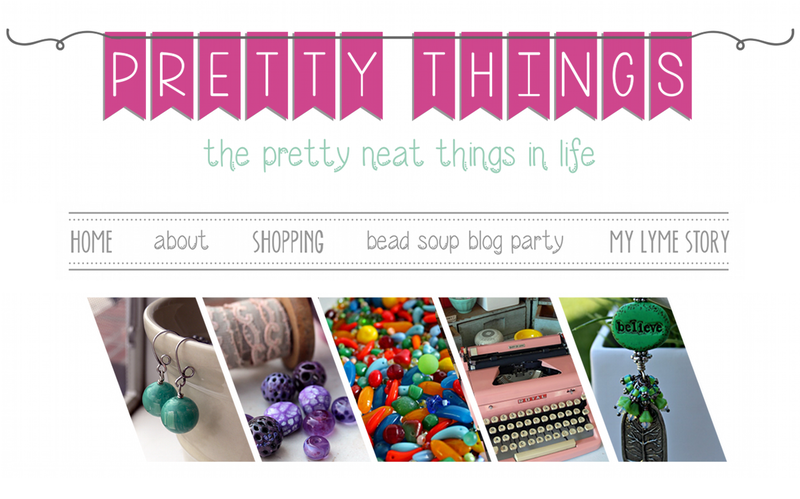 I have fingers and toes crossed hoping that I am the lucky winner of an incredible goody box. LOL...How funny!! This sure put a smile on my face! Thank you for sharing Lori! Thx for the great post..AGAIN! My family would be making a drive by there a gazillion times I'm sure. lol. What great spirit for that family to have and share. Hope you are feeling better and as good as you make your reader's feel. That story was too funny! OMG that's just the most creative Christmas yard I've ever seen!!!! Thanks for sharing! Oh Loei you are the best. Thanks for the laugh.. nice to have on a slow boring day at work!